It is important to understand how your home waste water treatment system works before you can truly understand all the benefits of taking care of it for you and for the environment. Septic systems are designed to recycle the wastewater produced in your home or business back into the environment. Without proper maintenance of your system it can be dangerous for your family, pose a threat to public health or the environment, and affect neighbouring property owners. 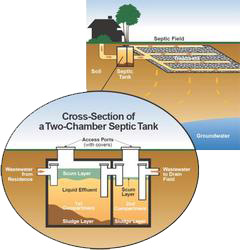 The two components of the septic system are a septic tank and a septic field which is sometimes called a leaching bed or a tile bed. A shown in the diagram above, the tank is the central component of the system that separates all your toilet flushes, bathwater and laundry discharge into sludge, liquid and scum. When the system is working properly the naturally occurring bacteria break down the sludge and the scum. The solids in the system that cannot be broken down settle to the bottom of the tank and must be pumped out regularly to ensure that the system continues to function. Any liquid in the tank flows out of the tank into a network of underground pipes that drain into the septic field or the tile bed. Naturally occurring ‘good’ bacteria in the ground break down harmful chemicals and bad bacteria removing impurities and returning the cleaner water to the ground for further filtering by the soil. Without pumping the tank regularly and having it inspected, you will have no knowledge of the condition of you existing septic system. How often you septic tank should be cleaned depends on the size of the tank at your home or business and the number of people using the building. To determine how frequently you should be pumping the septic tank we adhere to the Ministry of the Environments guideline that generally speaking, tanks should be inspected regularly and pumped every 2–3 years as required. The amount of water used and the volume of solids in the wastewater will also be determining factors. West Nipissing Sanitaion will help you understand the pumping frequency based on all your criteria and the best part is you will only have to figure it out once. If you opt in to our unique “Forget About It” program we will automatically inspect and maintain your tank on a regular schedule and you can have the piece of mind knowing that the job is getting done. The Government of Ontario’s document on maintaining your septic system, which you can download by clicking HERE recommends having you system inspected every two years.